San Lawrenz lies on the western side of Gozo, bounded by hills and not far from the island's most impressive natural wonders. This charming village has retained its customs and rural traditions and is well suited for those looking to enjoy a restful and relaxing holiday to Gozo. The area also benefits from an assortment of local amenities such as a handful of restaurants and shops. Based on the average temperature and humidity, the best time to visit San Lawrenz is March to June. However, if you want to partake in mostly beach activities, then late-June to mid-September are ideal. Rainfall is minimal throughout the year and conditions are mostly dry. The most popular attraction in San Lawrenz is its stunning coastline. Here, you can spend the day discovering the area’s beauty on a boat or on foot. Not to be missed is the nearby Inland Sea, a lagoon connected to the sea by a narrow tunnel, which extends beneath the cliffs. You’ll need your sea legs to get there, as it is only accessible by boat. It takes about 10 minutes and various locals offer trips on small boats. The turquoise waters in the Inland Sea are ideal for swimmers and snorkelers. There are many beaches just a short drive from San Lawrenz. 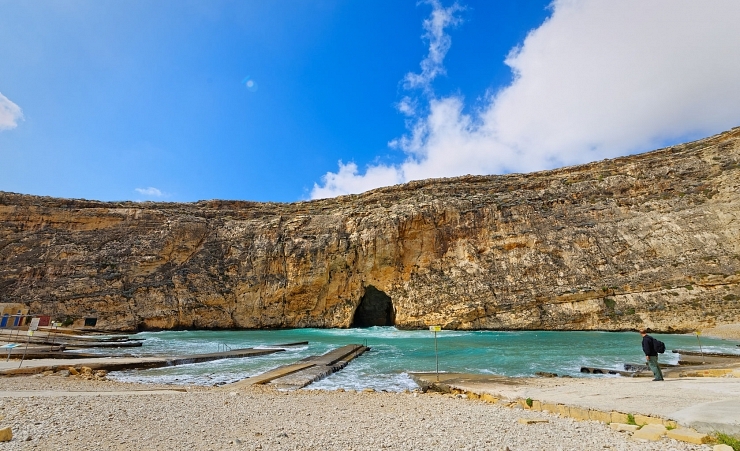 Xlendi Beach is just under 2 miles away and is a popular beach with its cliff and caves. Marsalforn Bay is another choice of beach near to San Lawrenz. Ramla Bay and San Blas Beach are also nearby. There is a large choice of restaurants to visit in San Lawrenz. Whatever type of food you prefer and, even if you have dietary requirements, you’re likely to find a tasty meal. Here, you can find European and Mediterranean food with vegetarian, vegan and gluten-free in some restaurants, including Tatitas Restaurant and Azure Window. San Lawrenz is a small and traditional village with roughly 566 inhabitants. As the nature of the town suggests, the nightlife here is fairly quiet. Enjoy a lovely meal at one of the restaurants and drink a few of your favourite beverages, however, if you are looking for a raucous night out, then your best bet is to visit the mainland of Malta. In the first week of August or last week in July, you might find the nightlife a little livelier as locals celebrate the village feast. The Feast of San Lawrenz has to be the village’s most famous cultural event. However you can also visit Saint Lawrenz Parish Church for a taste of culture. The church has been refurbished by villagers and is a tranquil place to visit. Dwejra Tower is another cultural excursion. The tower was built back in 1652 and is one of the Lascaris Towers. Initially built as a watchtower, it is now open to the public for sightseeing. Adventurers will enjoy a visit to Blue Hole, an picturesque diving spot accessible by boat. And, if you enjoy the diving experience, Inner Dive and Dive Gozo provide two more diving opportunities for you to get involved on your San Lawrenz holiday. Fly from most countries into Malta and take a taxi to the ferry port. The ferry will take you to San Lawrenz where you may need to take a taxi to reach your hotel. You can also arrange a transfer with Mercury Holidays before you fly. Ferries and water taxis are popular in San Lawrenz, too and cabs and taxis are also available. There are connecting bus services to various towns, too. Why holiday in San Lawrenz?